HIGH PERFORMANCE - The skateboard is super fast, has a 25 mph top speed and 30% grade hill climbing. 2 speed modes (low speed & high speed), easy to switch forward/backward. BUY WITH CONFIDENCE - SKATEBOLT electric skateboards have passed quality authentications of EMC, FCC, LVD,and ROHS.And we have maintenance point for repair and replacement in USA.If the product you received is defective in quality, please contact us immediately for replacement. 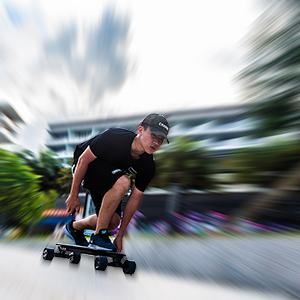 SKATEBOLT Electric Skateboard comes with 25mph top speed and 20miles max range with the sturdy 8 layers of northeast maple, which make you feel comfortable and steady on the board.Get around with the unbelievable speed and relax on the most fastest electric skateboard. 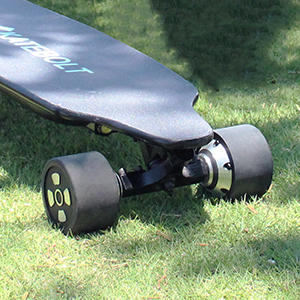 SKATEBOLT is an electric skateboard company established in 2016. Since the very beginning, Our main goal has been to offer electronic skateboards that are safe, convenient, and affordable. Electric skateboard has become much more than a toy; it has become the new trend of easy and convenient way of transportation in our daily life. We believe that's what SKATEBOLT can offer to you and more, an easier and mobile lifestyle. This board is extremely fast! It’s also able to pull a person who is 280 plus a person who is 190!